Most Bay Area residents have felt the earth move– quite literally. You probably know that the San Andreas Fault runs nearly the length of the state. But did you know that you can see the fault for yourself? As you follow the lines of posts that mark the various fault breaks in the Los Trancos Open Space Preserve, you can find out what’s happening when you feel that temblor underfoot. You may be surprised to see some of the effects of earthquakes in this otherwise tranquil Santa Cruz Mountain spot. The earthquakes felt in California are just one small effect of a global phenomenon. Earth’s crust is made up of several large, rigid, rocky slabs (called plates) that move atop the molten mantle underneath. Imagine cracked pieces of eggshell floating and moving on uncooked egg white. As new crust material wells up from ridges deep in the middle of the ocean, it pushes the plates into and away from each other. You’ll find earthquakes where two plates collide or slide past one another. The Pacific Plate (on the west side of the San Andreas fault) encompasses virtually the entire Pacific Ocean. The North American Plate (on the east side of the San Andreas fault) encompasses all of North America and Greenland. No wonder a bit of pressure builds up where the two come together. Scientists use satellites, laser beams, and observatories on different continents to measure the movement of the plates. They reflect laser beams from the observatories off space satellite mirrors. Since they know the location of the satellite, they can calculate the distance between the observatories. By comparing measurements from year to year, scientists know how far the continents have moved. North America and Europe are moving apart less than an inch per year. The Pacific Plate is sliding northwest against the North American Plate at a rate of about two inches per year. An impressive 70 percent of earthquakes occur around the Pacific Rim, in a region called the “Ring of Fire.” An east-west band from southern Europe through the Middle East and to northern India and southern China accounts for many of the rest. Earthquakes happen in a motion sort of like snapping your fingers. When you push your fingers together to create friction and then exert a slight pressure sideways, you create a force that eventually overcomes the friction. Your fingers slip, releasing energy in the form of sound waves. The same goes for earthquakes. The earth’s plates are pushed together like your fingers, but every now and then they slip sideways against each other. Instead of emitting snappy sound waves, the tremendous energy is released in the form of jolts on Earth’s surface. But the finger-snapping analogy isn’t perfect. When you snap, the slipping of your fingers against each other happens all at once. But in an earthquake, the motion starts at one point (hypocenter) and spreads up and down the fault line. Of course, this happens very fast, in some cases over 7,000 mph, or 10 times the speed of sound. The epicenter is the point on Earth’s surface directly above the hypocenter. Seismographs measure ground movement on a graph, sort of like a heart monitor. When an earthquake occurs, its effects are felt at different locations at different times, depending on the distance of each location from the epicenter. Scientists rarely have specific evidence at the actual epicenter, but they can use seismographic data to figure out where it must have been. Imagine an earthquake as a drop of water in a calm pond. Its effects are the ripples that radiate outwards. If an earthquake is centered in San Francisco, the data on seismographs would show that movement occurred first in San Francisco, then in San Mateo, then in Palo Alto, then in San Jose, and so on. Giant gaps opening in the ground and swallowing houses or towns during an earthquake are the stuff of legend–and movies. In fact, earthquakes are caused by the pressure of plates moving against one other, not splitting apart. But the movement of the earth during a quake does cause some interesting ground failures, such as those that occurred in the Santa Cruz Mountains during the 1989 Loma Prieta earthquake. Just as meteorologists can warn of impending hurricanes or tornadoes, it would be good to have some warning before a major earthquake hits. Lots of researchers are trying to figure out just how to predict the next big one. There’s no such thing as “earthquake weather.” And phases of the moon and nervous animals show no correlation with earthquakes either. The best that seismologists can do is to calculate probabilities. According to the U.S. Geological Survey, there’s a 67 percent chance of a major (6.7 or larger) earthquake in Bay Area in the next 30 years. In 2005, Berkeley lab geophysicist Valeri Korneev identified some seismic data that seem to correspond to the Loma Prieta earthquake. Searching through records of seismic activity that occurred in the two months before the October 17, 1989 quake, Korneev noticed an increase in the number of small-magnitude tremors–about eight times above normal levels. This activity was followed by a period of relative calm in the crust around the quake’s epicenter. Perhaps this rise and decline of activity in the crust surrounding a fault could help scientists predict the location and date of large, potentially destructive temblors. Centuries ago, the salt marshes and other wetlands surrounding the bay were much larger. Many were filled in to make more room for development. Levees closed off other wetlands to make salt evaporation ponds. The first salt ponds were created in the bay in 1854. 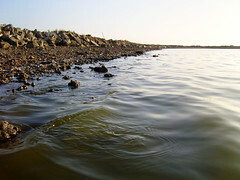 By the late twentieth century only 10 percent of the bay’s original wetlands remained, and many of those were in danger. In 2003, the state of California, the federal government, and private donors purchased from Cargill Salt 16,500 acres of salt ponds, an area about half the size of San Francisco. Over the next several decades, the South Bay Salt Pond Restoration Project will return most of the ponds to native wetland habitat. There are many opportunities to volunteer with the Midpeninsula Regional Open Space District (MROSD), including hosting the nature center, leading outdoor activities, or patrolling trails. They provide training. For more information, visit the MROSD website. The Bay Area Chapter of the Red Cross welcomes volunteers who have the time to commit to serious training. Find out more at the Red Cross website. Join the Los Trancos Open Space Preserve photo group on Flickr to share your photos of this amazing place.